I came across this store by accident when I was looking for apron patterns. Capricorn Vintage has some beautiful vintage 50s & rockabilly dresses for auction right now ingreat shape and still in the affordable range. Any of these would be wonderful bridal or bridesmaids dress alternatives or something for a guest to wear. Hurry- these end in the next 2 days! Labels: Vintage Wedding, What's on Sale? Get your vintage on! 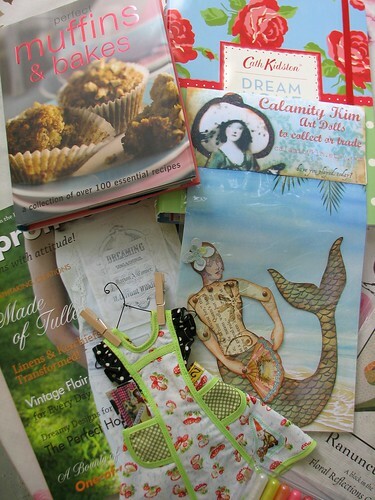 Another great apron giveaway at Calamity Kim that ends April 1st. You need to have a blog to enter. Fun, fun, fun! 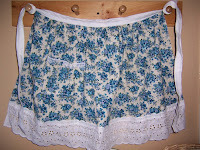 I have been included in my first Etsy Treasury- Woohoo! 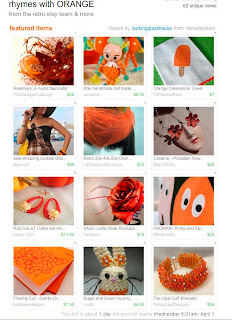 The name of it is Rhymes with Orange and it's got some great items from the RetroEtsyTeam on it. Mine is the rose hair fascinator in the 3rd row, middle column. Hey Cats & Kittens! 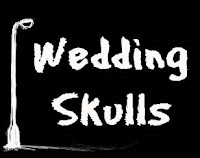 I have a guest post up at the Wedding Skulls blog right now on what rockabilly is. 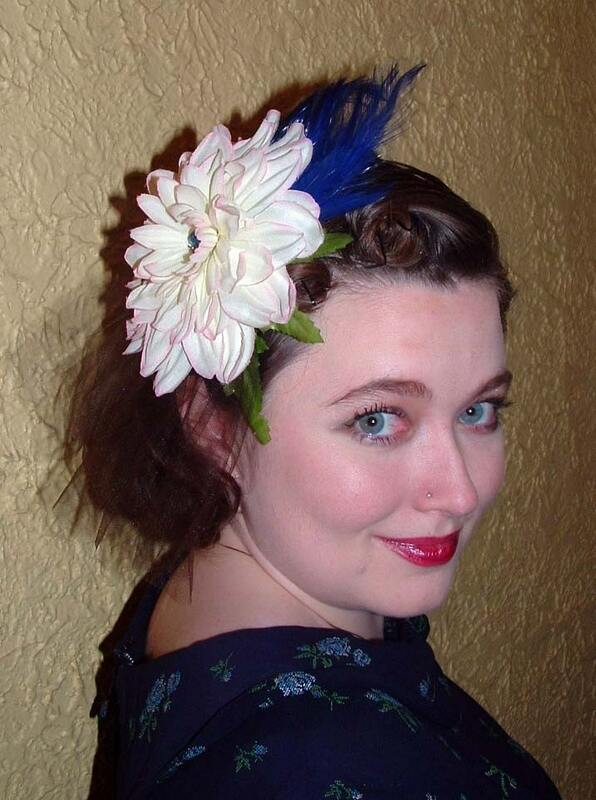 Steff Green recently guest posted on this blog and her offbeat blog is always a hoot! 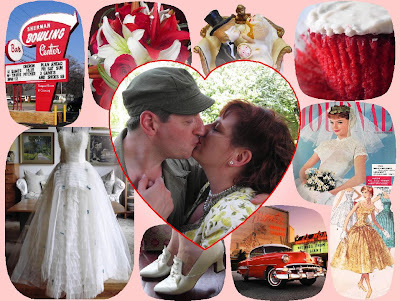 Interested in how to add harder elements to your rockabilly wedding? Go visit her right now. 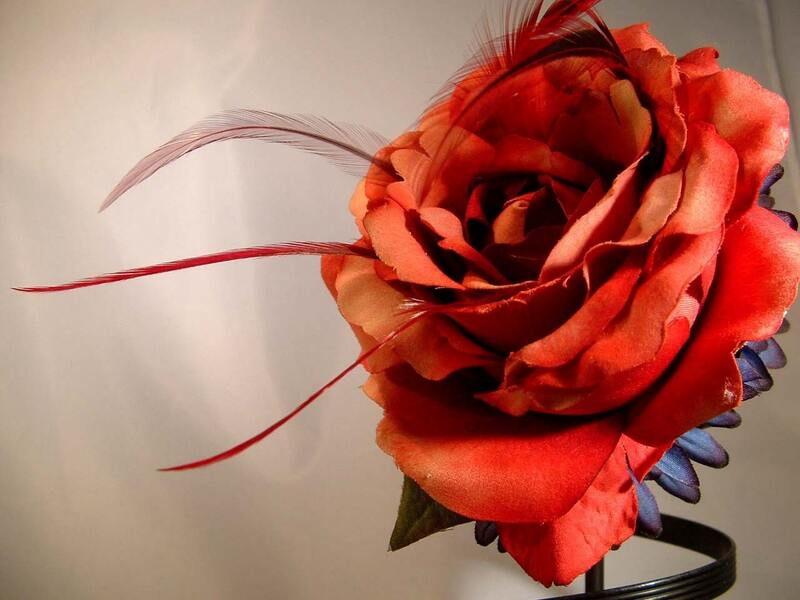 I have just marked down numerous items in my Tart Deco store, including some wedding items! Click here to get to my SALE page. Hurry, sale ends April 1st! Guest Post- Do Your Guests Care? Greetings, Tart Deco readers. Steph has kindly invited me along to talk about whatever takes my fancy (very brave of her, I reckon). I thought I'd take some time today to talk about some of the people who make our weddings special - our guests. I frequent a lot of online wedding forums and discussion boards, and guests come up frequently in conversation. Do any of these questions sound familiar? What will my guests think if we do this? How will I make my guests comfortable? What if the guests don't understand the significance of this? How do I please everyone when choosing food/music/favors/ceremony readings/seating plans? Brides have this horrible habit of stressing themselves to the point of snapping over unnecessary stuff. The online wedding community doesn't help – now there are hundreds of blogs, forums and discussion groups full of brides stressing together, like a gigantic multi-national PMS party. That word "guests" brings a shower of terror upon any bride. A swarm of people descending upon your perfect day, casting judgement over your carefully-coordinated decorations, personalized ceremony, and handmade favors. Under the scrutinizing eye of your guests, your funky candy buffet will seem tacky and childish, your Day of the Dead cake topper morbid and your red wedding dress an affront to everything marriage stands for. Couples forget their wedding "guests" are actually their dearly beloved family and friends, whom they've known and loved for years, and who have endured their offbeat, out-of-the-box fashion, ideas and choices for years. Your guests know your wedding won't be a white taffeta extravaganza, because they know you. 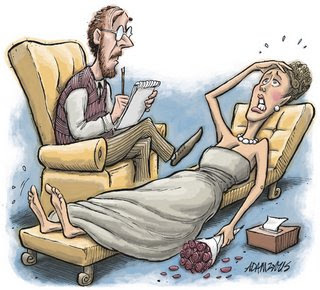 Stop worrying how your guests will react to every wedding decision. Your guests aren't there for themselves. They don't come to your wedding to stuff themselves with free food, slosh about the free booze, snarf down the free cake, delight in your free entertainment and come away with free presents for their trouble. While all that stuff open happens at weddings, it's secondary to the real purpose for the event. Your guests attend your wedding for you, to celebrate with you and eat and drink and be merry with you. So stop worrying that your guests won't be happy if the dress is odd or the decorations are odd or the music isn't to their taste or the wine is too lukewarm or the favour boxes don't match the chair covers. Give your guests cold cuts and orange juice and a happy bride who delights in their presence, and I guarantee every guest will walk away saying yours was the best wedding they'd ever attended. Her Save the date video is A-dorable and reminded my fiancee and me of us. Also love the talent show at the wedding. Once I hear back from her to confirm, I will get started on the veil to match her vintage Belgian dress. I'll make sure to post pics of it! 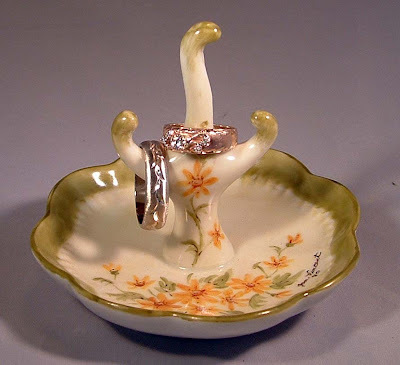 My fiancee and I were lucky enough to find vintage wedding rings for very little. I found mine on ebay for $100 and his was a gift from his father that had been given to him from a family member. We needed the rings to be restored to their original beauty and appraised and mine needed to be resized and have some engraving removed. We got the rings back from our jewelers yesterday (see below) and we couldn't be happier! Who is our jeweler you may ask? We met David Liska and his charming wife from David Liska Custom Jeweler at a wedding show at the Pfister Hotel and knew immediately that he was the jeweler for us! He was extremely interested in our wedding plans, was able to give us a rough estimate on costs right there and had a good handle on vintage rings and settings. We set an appointment right at the show to meet with him a few days later. At the appointment, David was very thorough and really took the time to find out our needs, while keeping in mind that we had a budget. He was able to pinpoint some issues with my ring settings and let me know my options and how much each would cost. He also talked to us about further down the road when we want to upgrade or design new rings, as we would eventually like to have my mother's first wedding ring reset. Not only is David an adept jeweler that has won several awards, he also a great person. He frequently does charity work within the community and keeps in touch with other businesses in the wedding community. He was even able suggest a florist to us that would have a handle on vintage arrangements and then mention us to her when he saw her. A real swell guy! Fear not readers outside of the Milwaukee area, David Liska Custom Jeweler also takes clients online on a regular basis. You can view a tour of his office and working space and read more about him and his associates on his website, as well as email him to discuss your ideas. Make sure to let him know you read about him on my blog! I made an inspiration board of things that I am using at my wedding or am "inspired" by for my wedding, hence the name Inspiration Board. I have included where I found the items in case they tickle your fancy. I am getting ready to finish up my wedding veil next week. 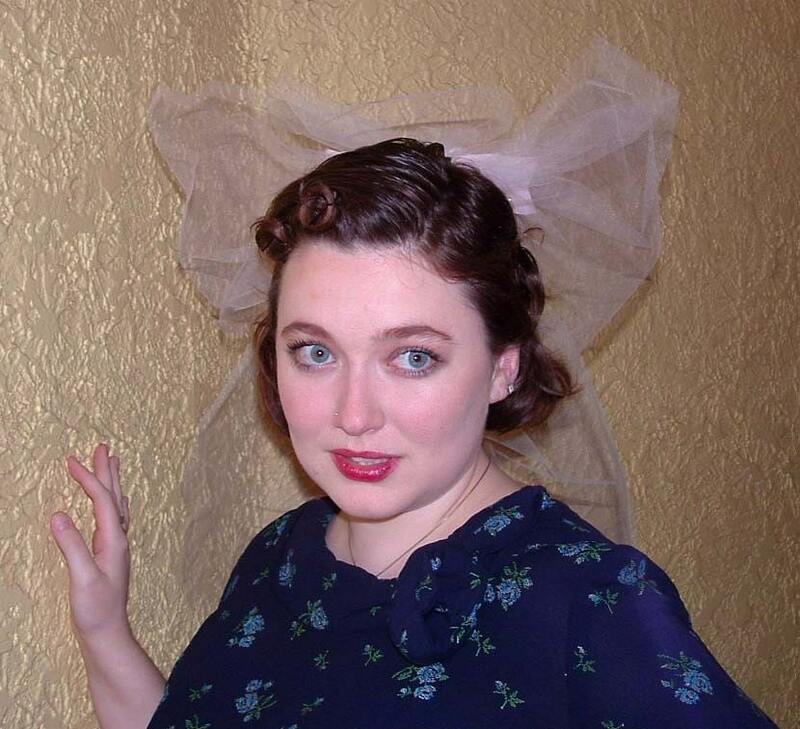 I am adding a cathedral length veil I found at a thrift store to a vintage 50s bandeau hat with bow. I am making the veil detachable and adding a short fluff of red tulle that matches my crinoline, as well as some vintage red rhinestone jewelry. I will be making a DIY tutorial on this that I will be posting once it is done. Needless to say, I am feeling inspired. I love reading other blogs to find the ways that other non-traditional brides are finding their inspiration. So to celebrate finishing one more task, my birthday coming up, and my new Movie Musical accessory line, I am giving away a custom petit veil to one lucky non-traditional bride! How To Enter: I'd like to learn more about you and your wedding. Leave a post by Wednesday, March 18th before midnight (central time) telling me about a non-traditional aspect of your wedding and what inspired you to do it. Pictures and links are always welcome :) I will pick the entry I think is the most unique or just stands out to me and post the winner on Thursday. What You Win: A custom petit wedding veil (similar in size to the one in the picture) based on your choice of colors and/or wedding theme. The length of veil can be shoulder length or shorter. I will contact the winner to discuss options once they have confirmed. 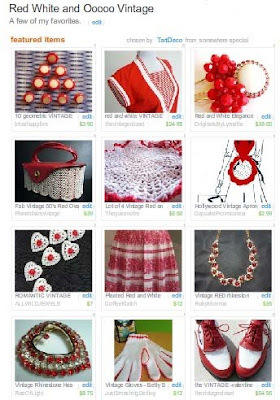 I just ganked my first treasury and it is almost all vintage rockabilly items. I found most of this stuff while searching for my wedding so the color scheme is red and white. The Rock 'n Roll Bride has posted about a hot rockabilly wedding from Brazil! I am hoping to get a few more pics from the bride to post here, but in the meantime, give Rock 'n Roll Bride some love and check out some more pics! I am excited to announce that I have been accepted as a Pink Bride blogger at The Pink Book website! This wedding resource and planning guide is a great tool for anyone planning a wedding, especially because they also break up their information into locations, so I will be the Milwaukee, WI blogger. My plan is to post tips on planning non-traditional and vintage weddings in the greater Milwaukee area so it will fit in nicely with what I do on this blog but not duplicate it. I will also be giving information that is non-location specific too, so you don't have to be in Milwaukee to read, I promise. I will posting on Tuesdays, so make sure and register at the site. My fiancee and I are both closer to 40, live in a one bedroom apartment and have A LOT of stuff. We definitely don't need more, that's for sure. So instead of a traditional store registry we set up a honeymoon registry. That way, we can plan our dream honeymoon and our friends and family can contribute to it by purchasing various pieces of it. You can break the large price items into smaller units to make it affordable for everyone. I did my research and decided to go with honeyfund.com because there are no fees and they don't take a percentage of the money. You can set up a paypal account for people to pay with credit cards (paypal charges 3.5%, which is still better than the 7-10% of most honeymoon registries). The site is pretty easy to set up and they offer sample honeymoons for ideas that you can pull from for your registry. They also allow links to items if you would like to show your guests directly some of the nifty things you will be doing. I can't wait to see what people think of our historical trip to Salem where we will be staying in a carriage house next to a castle! I had to rack my brain for a while to come up with gift ideas for my bridesmaids that I thought they would each enjoy, hopefully use, and not kill me financially. Since my wedding hasn't happened yet, I will have to blog about what I got them later, however I have been keeping my eye out for little trinkets that I could add on and I thought I would post them for you. I recently discovered an online shop called Plasticland. 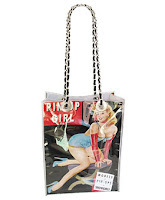 In the clearance section, I discovered this cute pinup bag for $23.10. The bag is roughly the size of a piece of paper, so its a good size to fill with goodies and not break the bank. Also from Plasticland, a retro vinyl CD label kit. 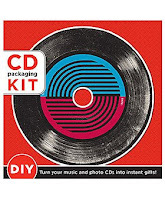 At $15.95, its around the same price as a regular CD label kit but WAY cooler. I would be excited to get this as a gift from anyone! One last item from Plasticland, a pin-up magnet set at $14. I did find this for slightly less at another shop, however if I were getting other items from this store it is actually cheaper to get it here because of the savings on shipping. In fact, orders over $100 have free shipping. One surprise for my bridesmaids I don't mind giving away is an awesome etsy shop called Sugarcandiebeauty. 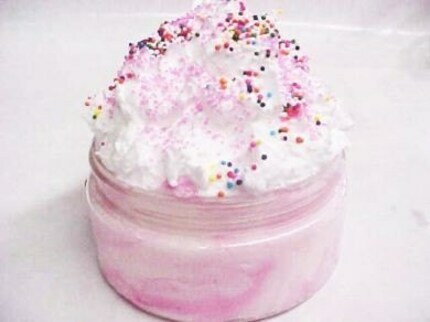 I found them while looking for a new supplier of bath scrubs for myself and completely fell in love with their ever creative line of scents like Vanilla Cake Batter Bites and Pink Bikini in Maui (my personal favorite). They smell so good it takes everything in my power not to eat them- and I'm not kidding because they REALLY look like the picture. I worked directly with the shop owners to customize a special order for my wedding party for 3 oz "samplers" of different scents. They were extremely helpful, answered every question promptly, offered suggestions and shipped the whole order within a week. Special bonus: they always send extra samples with every order and they usually have some kind of special running, so visit often! One last item for this post, although I am sure I will have more soon, is a listing on Prettypionidesigns for these delicate and elegant hairpins. Rockabilly girls are known for their love of hats and these pins would look lovely while securing a snazzy little number to a girl's noggin. At $10 for 4 pins they are a great deal too. She also has other designs to choose from.